From the Caspian Sea to China – Kazakhstan is the world's 9th largest country that stretches from the Caspian Sea in the west to its eastern boarder with northwest China. The former Soviet state gained independence in 1991 Astana (pictured) was made the capital in 1997, taking the honor from Almaty, which is the country's largest city. Presidential privilages – Nursultan Nazarbayev has been Kazakhstan's president since the first national presidential elections in 1991. Through constitutional amendments in 2007 the former Soviet Communist Party Politburo member, eliminated term limits for himself. The 71-year-old won the April 2011 presidential elections with 95.5% of the vote. International observers have never declared any elections in Kazakhstan to be free or fair. 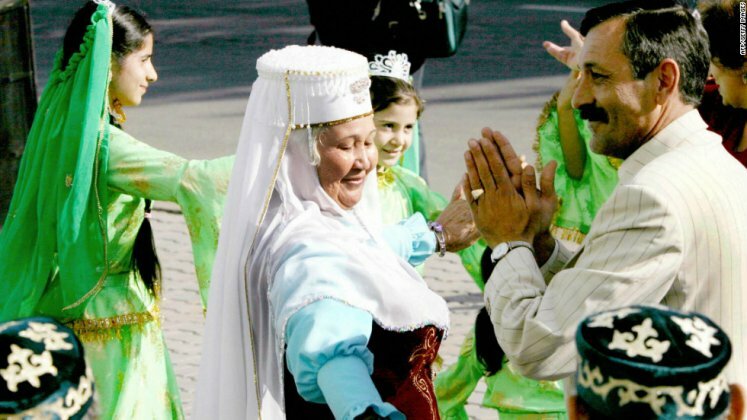 People and ethnicity – The major ethnicity is Kazakh; other ethnic groups include Russians, Uzbeks, Tatars and Germans. About 55% of the population is urban and the rest is rural. Kazakh and Russian are spoken by the main languages. Where Christianity and Islam meet – Kazakhstan is officially a secular state, but Sunni Islam is the major religion (47%). Russian Orthodox Church is the dominant Christian church (44%). There are also Protestants (2%), Roman Catholic (1%) and other communities. Yurts – Kazakh, Central Asian and Russian cuisines as well as Italian, Turkish and Korean restaurants are popular. Traditionally, guests are offered Kazhak food at the low table in a yurt, a traditional Kazhak house. Reserves to spare – Kazakhstan is rich in oil and is thought to hold at least 3% of global oil reserves. It is also close to becoming a net gas exporter. According to many specialists, almost all elements of the periodic table could be found in Kazakhstan. Tianshan Mountain – Kazakhstan is home to a range of mountains. Tienshan mountain country is located in the south-eastern part of Kazakhstan on the border with China and Kyrgyzstan. An ethnic Kazakh community lives in the multi-ethnic Xinjiang province in China. Artwork Description Astana tower, Astana, Kazakhstan, Central Asia. How many people live in kazakhstan? 15,300,000 people live in the Kazakhstan area. What are the people from Kazakhstan called. What do people in Kazakhstan think of Borat? In the beginning, people were offended. Now, they mostly stopped caring.